From Jesus’ command to “love your enemies” to the idea of “holy war” is a giant leap. Yet from the Old Testament through to the Crusades and the inquisitions, Christian history is full of violence. Has Christianity been a major contributor to war? How have the followers of a crucified leader managed to get things so wrong? This segment takes a look at one of the most notorious episodes of Christian history: the Spanish Inquisition. SIMON SMART: In any list of the greatest evils committed by the church through the ages, “Inquisition” generally comes right after “Crusades”, and with good reason. 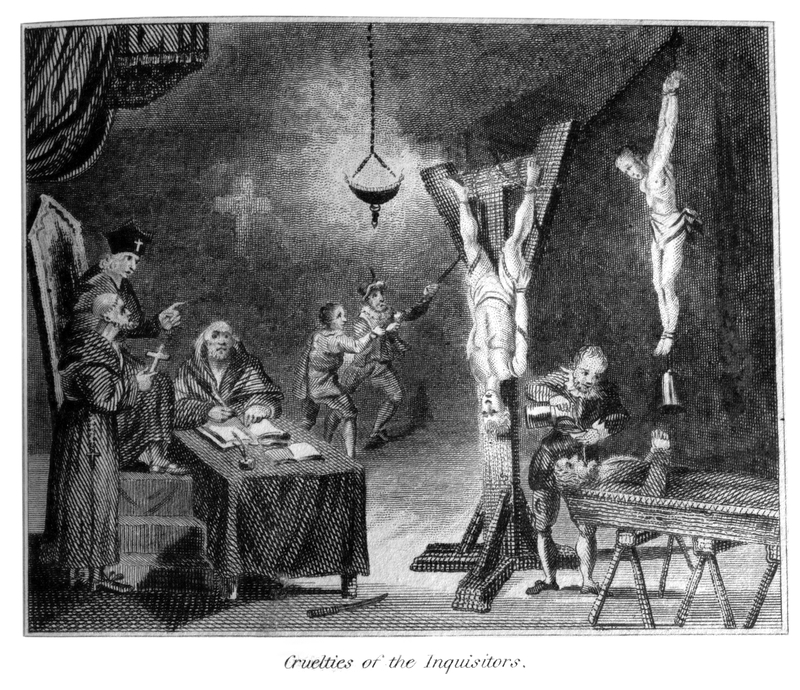 Inquisitions were trials for heresy, run by church or state-appointed inquisitors. ANDY KELLY: When it first started inquisition was better described as inquisitorial procedure. It’s a way of proceeding in a criminal case in which the judge is also the investigator. It wasn’t really very suitable for heresy because in order to be prosecuted a crime had to be public. A judge could not bring a case against somebody unless the general community singled out this person and said that he was guilty. And with heresy you’ve got … that this is a very private thing, this is private thoughts and so on, and so it’s hard to prove. And so, the heresy inquisitors started violating due process fairly early on by interrogating witnesses to testify against themselves. SIMON SMART: When people think about inquisitions, usually they’re thinking about the Spanish Inquisition, which terrorised people from Spain to Mexico for 350 years. The whole thing started as a way of dealing with the supposed problem of Conversos, or Jewish converts to Christianity. The Converso community was wealthy and powerful. They held prominent positions in finance and government – so you can imagine they were resented by a lot of people, including the clergy. The Inquisition came from a rising groundswell of fear and suspicion. Were these people really Christian? Or were they pretending to be Christian, but actually, secretly Jewish? The Spanish Inquisition was established in 1478, here in the town of Seville. And from the beginning, it relied heavily on the ill-will of neighbours. Many of the Conversos had never been Jewish – it was their parents or grandparents or even great-grandparents that had converted to Christianity. But even for those who had been Jewish, many of the charges against them were simply ludicrous. People testified that they’d seen a Jewish object in someone’s house 30 years ago. One elderly woman said she’d heard her neighbour utter a Jewish phrase 50 years ago. It was crazy stuff. If they “confessed” straight away Conversos could often make a cash payment to the inquisitors and get their slate wiped clean. CHRISTINE CALDWELL AMES: The Spanish Inquisition was a state institution, and one of the great suspicions about the Spanish Inquisition which we don’t seem to see about medieval inquisitions is that inquisitors generated accusations, that is they wanted to find people that they could suspect, people who would be guilty, for the very purpose of sustaining the institution. SIMON SMART: Even the Pope thought it was getting out of hand. ACTOR (POPE SIXTUS): The Inquisition for some time has been moved not by zeal for the faith and the salvation of souls, but by lust for wealth. And many true and faithful Christians, on the testimony of enemies and rivals have, without any legitimate proof, been thrust into secular prisons, tortured and condemned as relapsed heretics, deprived of their goods and property, and handed over to the secular arm to be executed, causing disgust to many. SIMON SMART: Here’s how it went. The accused would be arrested and would disappear into the bowels of the inquisitorial palace – the Castillo de San Jorge. There, they would remain, cut off from the world, sometimes for years. A cleric called Gabriel Escobar was arrested for heresy in 1607, and died in prison 15 years later, still awaiting his trial. A lot of the stories of the torture methods of the Spanish Inquisition turn out to be the fanciful creations of later Gothic novelists. Things like mice burrowing through people’s stomachs, or roasting a victim’s feet over the fire. But the reality was terrible enough. Sometimes just being shown the instruments of torture was enough for people to make up confessions just to stop the pain. To be fair, historians estimate that 90 percent of the people brought before the Inquisition were not tortured. And it’s worth mentioning that torture was standard practice in civil courts across Europe at the time. That culture thought very differently from us on these things. ANDY KELLY: Roman law was compiled by Justinian in the 6th century and it’s filled with questions on torture. As a matter of fact, the word “question” itself usually means torture. So, you put him to the question, that means that you put him to the torture. And so these laws were adopted by the church. It was fully approved that church courts could use torture both for witnesses, for defendants, and sometimes even for accusers. SIMON SMART: One of the most infamous traditions of the Spanish Inquisition was the auto-da-fé – literally, the “act of faith”. The convicted would set out from the prison barefoot, wearing the notorious pasteboard caps. They also wore the sanbenito, a tunic to represent their crimes. Yellow for those who confessed and were to be spared. But they were the lucky ones. Those who’d refused to confess wore a black sanbenito with a design of flames, and sometimes demons and dragons to signify the hellfire that awaited them. They wore red caps. They were destined to be burnt alive. When they reached the Plaza de San Francisco, the charges were read out. If a “heretic” repented, the proceedings would halt, candles would be lit, songs sung, and everyone would applaud. At the completion of the auto-da-fé, those condemned to death would set out once more, finally arriving at the Plaza San Sebastian – their “point of departure”. It wasn’t a tram stop back then, but the city built an enormous stone platform here called the quemadero – or burning place. And before the condemned were tied to the stake, they’d be asked one last time if they’d like to be reconciled to God and receive mercy. And if at that point they repented, they’d be “saved from the fire”, they were told. They’d be strangled instead, and then burned. Some mercy! The inquisitors were “men of God”, which meant they could not kill anyone. So, the Inquisition merely condemned people and then “relaxed” them into the hands of the state to be executed. The hypocrisy is staggering. CHRISTINE CALDWELL AMES: The myths of the Inquisition have certainly tended to exaggerate the numbers of people killed. But, inquisitors were present at executions, they crafted very detailed explanations for why the person deserved to be executed, and so even though the number is much smaller than we have long thought and that the myth said that it was, it happened, and that’s something to be confronted and understood. SIMON SMART: Whatever the numbers of those killed, the whole idea of persecuting people for their beliefs is a horrifying expression of faith. A medieval bishop called Wazo summed it up well. ACTOR (WAZO): If the church seeks to destroy the human beings that God created, and condemn those that he redeemed, it withholds from human beings the charity and forgiveness that God himself had shown them. SIMON SMART: When you think of the crusaders massacring Jews and Muslims, and of the fear and the torture, and the determination to control, the abuse of power that was the Spanish Inquisition; and then you think of Jesus, and his compassion, the way he related to people, that he didn’t force anyone to do anything – well, it just doesn’t make any sense. ROWAN WILLIAMS: When Christianity has got into the business of coercive force, Spanish Inquisition or whatever, it’s not been very impressive. It’s produced external conformity, internal resentment, and I think a deep wound in the credibility of Christianity in the long run. Have you ever been punished for something you didn’t do, or that you did but didn’t believe was wrong? How did you feel? Have you ever argued with someone about their beliefs? What were you trying to achieve? Why do you think these articles were included in the UDHR? How important do you think the rights to freedom of belief and expression are? Should there be any limits to these freedoms? Can you think of any modern examples that you have heard about where these rights have been denied? Write your definition of the word “heresy”. Why do you think heresy might be a big deal to some religious groups? 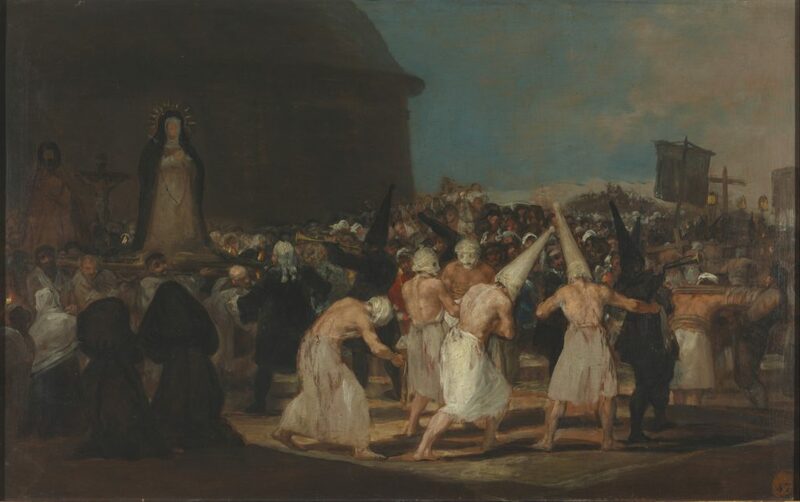 What observations can you make about the following images depicting the Spanish Inquisition? Why were Conversos resented in Spain in the 1400s? How were charges brought against the Conversos? What kind of evidence was required? What does this quote from Pope Sixtus IV tell us about the motivations of many of the inquisitors? What are some of the misconceptions about torture in the Spanish Inquisition that are clarified in this segment? Imagine you were part of a crowd watching an auto-da-fé. Write a blog post describing what happened and how you felt. Simon Smart quotes a legal expert at time of the Inquisition who wrote of the auto-da-fé: “The goal was the education of one and all – and also, to terrify.” What do you think he meant by this? Why would the Inquisitors want to terrify the crowd? Articles sometimes appear citing the “millions” killed in the Spanish Inquisition, but expert scholars now estimate that approximately 6000 people were killed, over a 350-year period. To what extent should this influence how we see the Inquisition? Do the numbers matter? Explain what Wazo is saying in your own words. How do you think the Inquisitors could claim to be following a God of charity, forgiveness, and compassion while condemning “heretics” to death? What do the following elements in this parable represent? How does the owner respond when the servants ask whether they should pull up the weeds? What reason does he give? Is there anything in this story that you find distressing or offensive? If so, why? What lessons might this parable teach us about how to respond to people whose beliefs we strongly disagree with? In another place, Bishop Wazo pointed out that Jesus, “mild and humble of heart”, preferred to suffer abuse and shameful treatment and even death rather than do violence to others. How is this evident in this account of Jesus’ arrest and “trial”? What parallels can you see, if any, between the actions of the Jewish leaders and Pilate, and those of the Inquisitors? Can you think of any “social heresies” of our time – beliefs that are unacceptable within our culture? Do they make you uncomfortable? Read this article in The New York Times about public shaming in the internet age. What parallels can you see with what happened in the Spanish Inquisition? What differences are there? Have you personally seen ways that social media can be used to silence unacceptable beliefs? Do you think it could it be used instead to foster open debate and respect for other points of view? Plan a week-long social media campaign to encourage honesty, tolerance, and compassion towards everyone in your school or community, regardless of their beliefs. Include at least two Facebook posts, two Instagram posts, and two tweets. Choose one of the fictional representations of the Spanish Inquisition listed below. Write a one-page reflection on how the Inquisition is portrayed in the example you have chosen, including how historically accurate you believe it to be, and what message is being conveyed by the reference to the Inquisition. Watch the segment: “Witches: Fear and loathing in Salem”. Make a list of some of the parallels between the Spanish Inquisition and the Salem Witch Hunts.